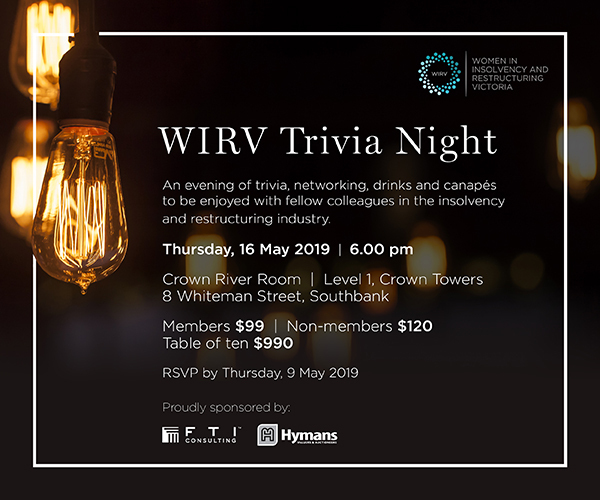 WIRV will hold its Annual Trivia Night on 16 May 2019. Join us for an evening of trivia, networking, drinks and canapes to be enjoyed with fellow colleagues in the insolvency and restructuring industry. Tickets are $99.00 (inc GST) per person (members), $120 (inc GST) per person (non-members) or $990.00 (inc GST) per table of 10. This evening is kindly sponsored by Hymans and FTI Consulting. Book fast so you don’t miss out on this fantastic event. We look forward to seeing you there. 94 available	 Member AUD $99.00 Please ensure your email address matches your membership account.